I will attempt to point out some mistakes made by both teams in the post-game analysis, which may be helpful for players at that particular skill bracket, and also because it will be interesting to see the evolution of play skill from low to high skill. I score 5 straight wins, bringing me from 2265 to 2363. Overall there was only 1 game with an abandon. 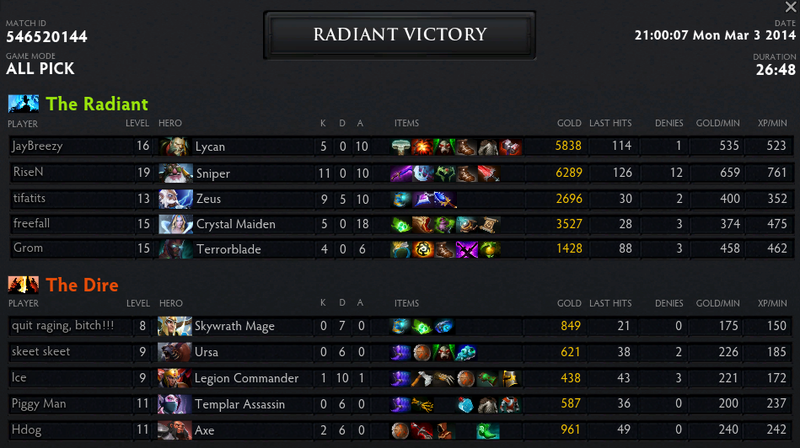 Early Game: We lose our lane, as Lycan is unable to farm well against an Axe and Ursa. Eventually we decide it's more profitable for Lycan to go jungle and for me to leave and go roam other lanes. Mistake 1: The enemy team had 4 heroes which don't come online until they get their Blink Daggers. None of them did, which is why their kill potential was very low. No more than 2 heroes should require Blink Dagger, so you can prioritize farm to them. Mistake 2: They try to counter the Shadowblade on our Sniper with sentries. This is the wrong use-case. Sentries are used to prevent invisible heroes moving towards you, while dust is used to prevent invisible heroes from escaping. You would buy sentries to protect yourself against a Nyx or Shadow Fiend. You would buy dust to help you secure a kill on a Sniper. 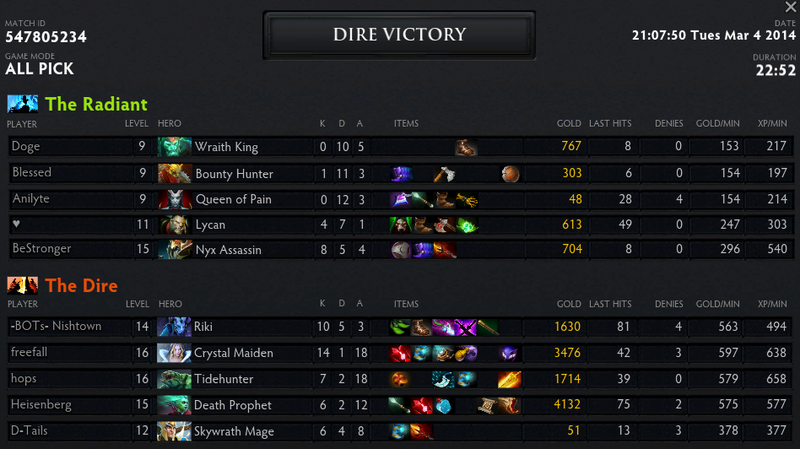 Warding: The enemy CM kept the map well warded, but neglected detection for our Riki. Early Game: Our bottom lane feeds the enemy Juggernaut 5 kills in the first 9 minutes, giving them a sizable gold and exp advantage. My lane was a loss, as the Spectre I was babysitting had constant lag issues for the first 10 minutes and was unable to farm. I was unable to even leave the lane to stack and pull. The enemy ended up with a 3000 gold and exp advantage going into the mid-game. Mistake 1: My team picked 4 melee heroes. This is a bad idea. It is however an extraordinarily bad idea when the top lane has an Axe, mid lane has a Sniper and bot lane has a Juggernaut + CM combo. Naturally we lost all 3 lanes. Mistake 2: Bloodseeker should not build a late Radiance, as the burn damage is a non-factor late game. If his farm won't allow him to get an early Radiance then he should go for cheaper items like a Basher + Orb of Venom rather than walking around with brown boots 30 minutes into the game. Mistake 3: The enemy Juggernaut had a fantastic start, scoring 5 kills in the first 9 minutes and getting the double the GPM of any of our heroes. 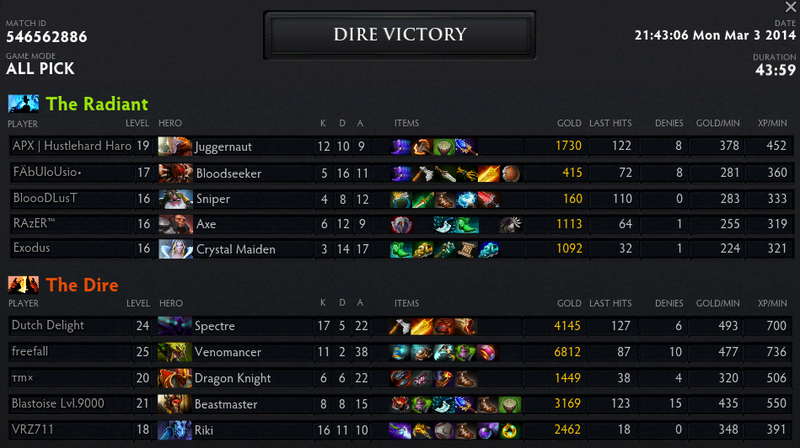 However, Juggernaut's power falls off dramatically in the late game. Teams that utilize Juggernaut need to be push oriented to turn the early kill advantage into a tower advantage, or run him as a secondary carry so they still have a primary carry that will win them the late game. Early Game: I secure first blood for my lane with the starting Double Damage rune, and get another kill a minute later, winning us the lane easily. 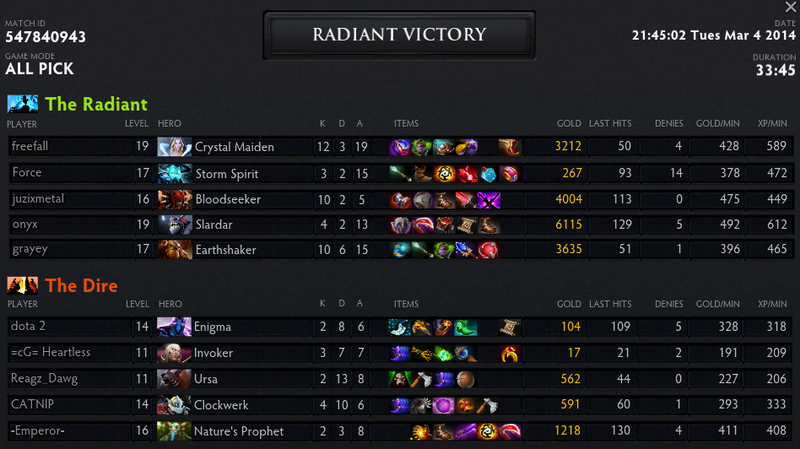 I won the fourth game as Crystal Maiden (duo offlane with Tidehunter) at 2339 rating. Early Game: I don't know what to say, we got 6 kills in our lane in 5 minutes, we were facing a Wraith King, Bounty Hunter and a jungling Lycan who ended up dying when he dived our tower. 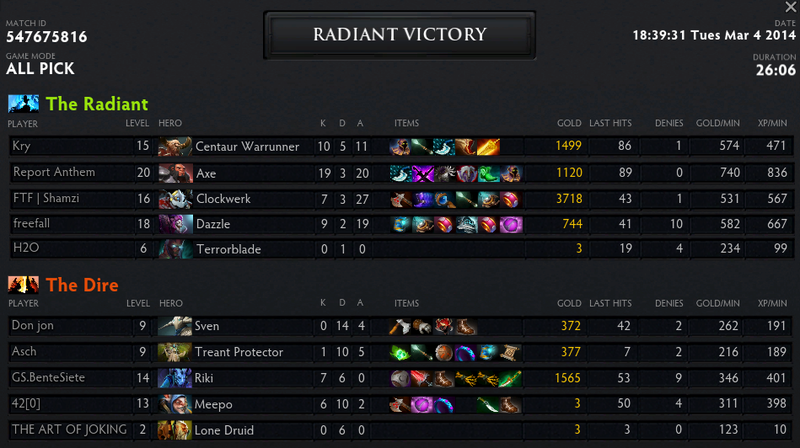 I won the fifth game as Crystal Maiden (triple safelane with Bloodseeker and Earthshaker) at 2363 rating. Early Game: I help secure the first few kills of the game, first blood on bottom and then ganking their mid Invoker as he comes for the rune. We did not intend a trilane but the Slardar and Storm Spirit demanded solo lanes, it's ironic that those two heroes did not end up doing very much.